It’s almost New Year again – Chinese New Year! The Year of the Dragon starts on Monday, Jan 23. Just in time for me to share some (mostly food-related) snapshots of my trip to Hong Kong. Along with the usual rounds of family, holidays, and general gluttony, I also went on an egg custard tart-eating quest. This traditional dessert now appears in all sorts of variations around town – flaky crust, cookie crust, mini size, Portuguese style…they get really addictive! Egg custard tarts, mini size. The lighter colored one in the back is made with egg whites – the “healthy” version of egg custard tarts. 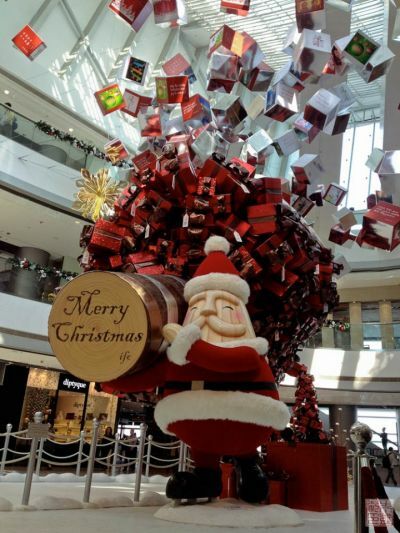 It’s always fun to see the extravagant holiday decorations around town, like this supersized Santa. 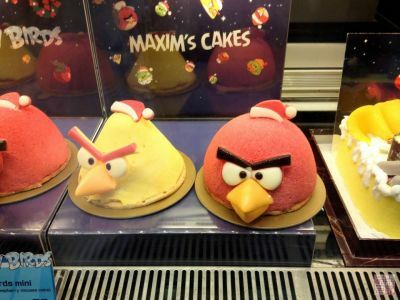 Angry Birds was big in Hong Kong this year – avian-themed merchandise abounded. My favorite spotting was these Angry Bird cakes, complete with Santa hats. The macaron craze is still strong over there; here I am holding up a macaron in front of Le Gouter Bernadaud. 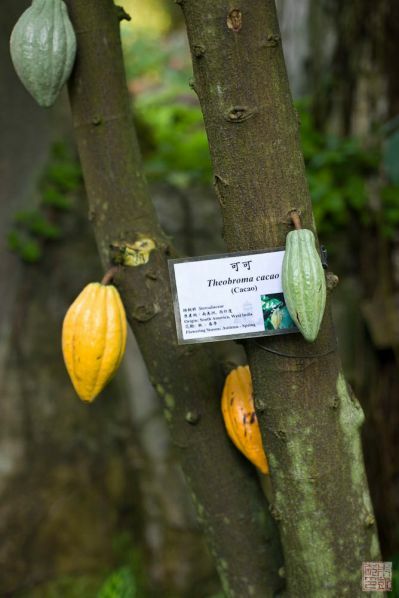 Look what I spotted in the Botanical Gardens – a cacao tree! I love these Chinese donuts. 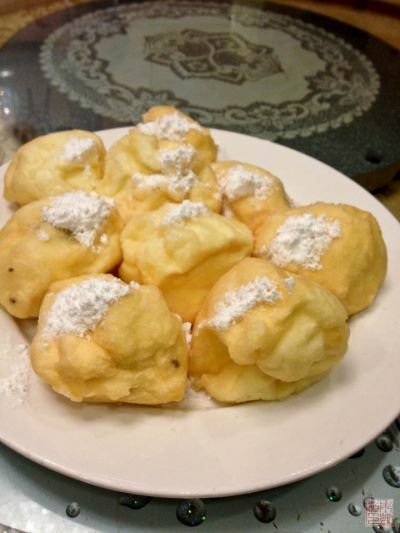 These aren’t the youtiao served with hot soy milk at Chinese restaurants; they are more like beignets, fluffy clouds of fried dough heavily dusted with powdered sugar. The lighter and less greasy they are, the more skilled the chef. 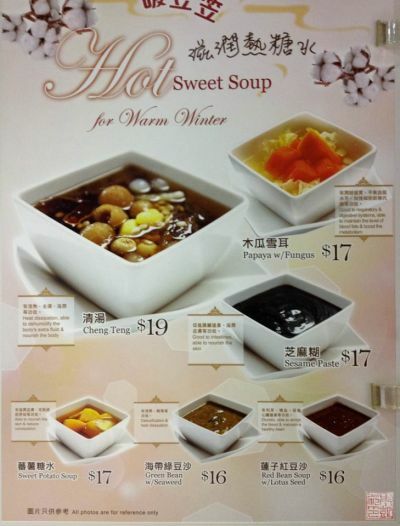 A poster advertising various sweet soups, a popular choice for dessert on a chilly winter night. My favorite is the black sesame paste, a big warm Snuggie of a soup. Another classic Chinese candy that I can’t find in the US: dragon beard candy. Spun sugar wrapped around peanuts and coconut, it’s like a more sophisticated cotton candy. The silky white threads are meant to resemble dragon whiskers, hence the name. Although you can buy it in packages, part of the whole experience is watching the street vendor make it, and eating it fresh. One of my guilty pleasures is looking for incidents of Engrish, especially on menus. I have to say this is one of the funnier examples I’ve seen – fish gangsters! (P.S. 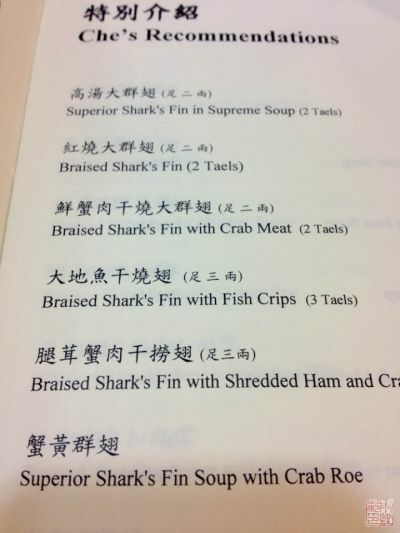 I wanted to also note we didn’t actually eat any shark’s fin – it was just on the menu). Believe it or not, the advertised effects of the ginger tea above are meant positively – ginger is often taken for its health benefits. 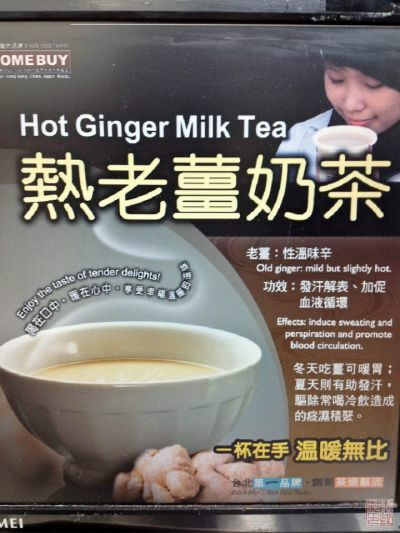 I found the drink a little too gingery and spicy for my taste, but the husband loved it. 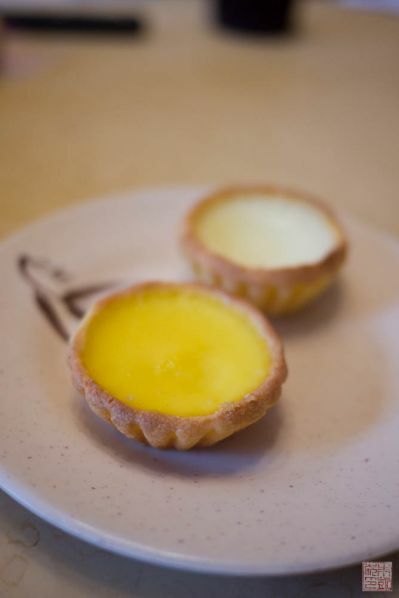 More egg custard tarts, this time from the famous Honolulu Cafe. 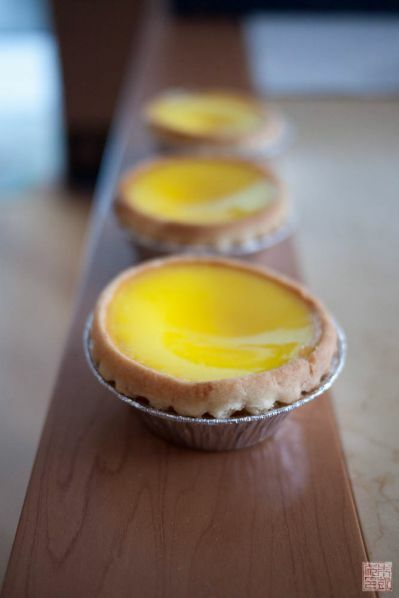 Their tarts have the flaky crust, and a pleasantly eggy custard. So far my attempts to replicate the flaky crust have met with middling results; until I have something I’m happy to show off, I’ll share a recipe for a simpler egg custard tart with a cookie crust at the end of this post. 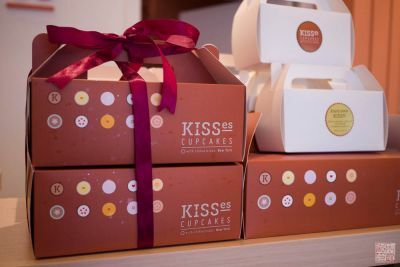 Here’s a cupcake emissary from the US: the famous Chikalicious of New York City has set up a cupcake shop called Kisses in Central District in Hong Kong. The shop features a mix of classic and Asian-inspired flavors. 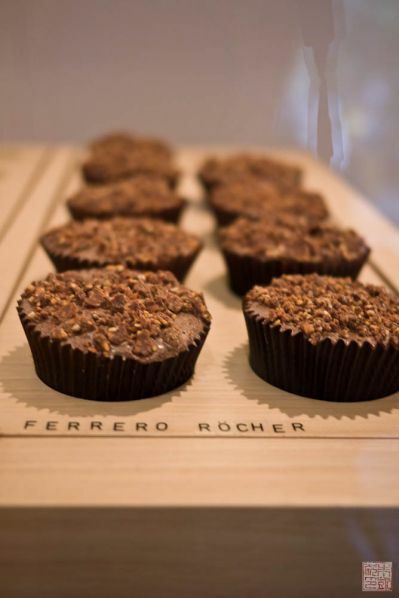 The Ferrero Rocher flavor is one of the best sellers, not surprising to me since the candy is a classic choice for gift-giving in Hong Kong. 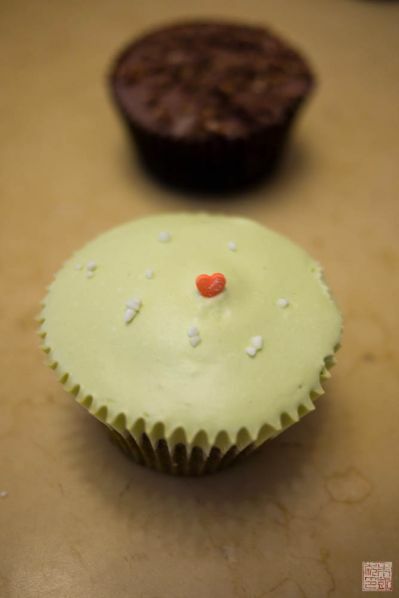 I liked the Ferrero cupcake, but my mom preferred the green tea cupcake. The store manager told us that they make their cupcakes less sweet to suit the locals’ tastes (like my mom). In fact, “less sweet” was a common refrain at bakeries around Hong Kong. 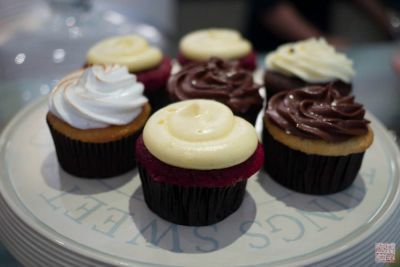 Sift Bakery, one of my favorite bakeries in my parents’ neighborhood, also introduced its own line of cupcakes. 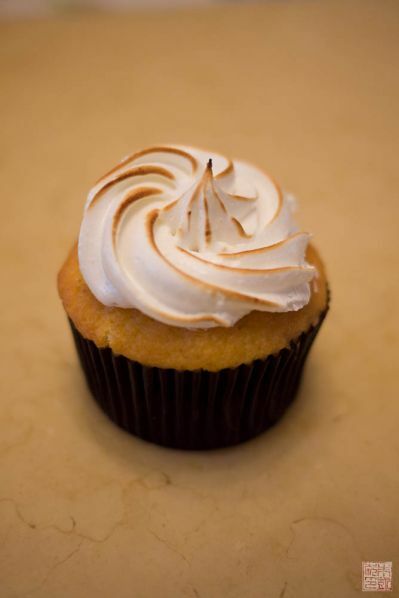 I tried their lemon meringue cupcake, which was pleasantly zesty and had a great balance of meringue and cake. 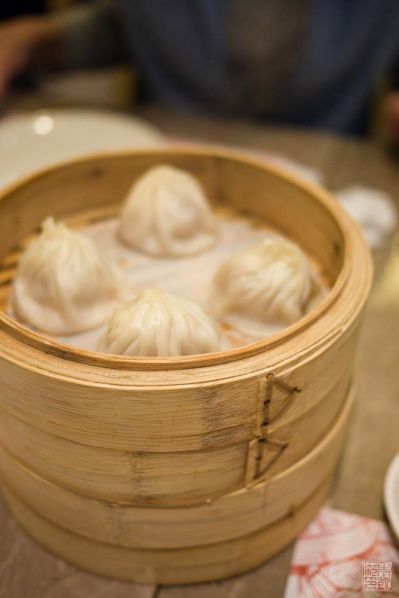 No trip to Hong Kong is complete without eating as many xiao long bao as possible – preferably at Crystal Jade. Normally, there’s no point in trying to sneak egg tarts on a plane back to the US – they’re much better fresh. But I did bring back one tart – this giant egg custard tart pillow I got as a Christmas present. Snickers isn’t quite sure what to make of it. 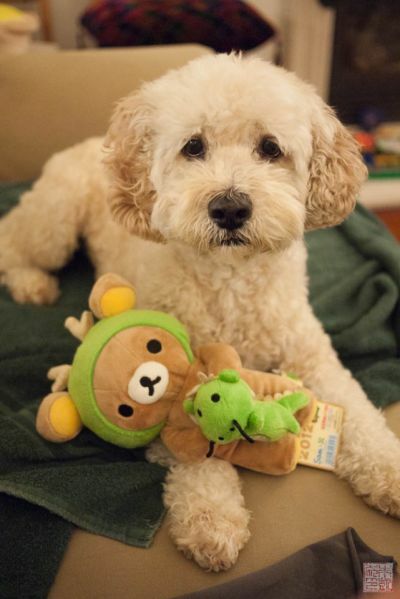 And another shot of Snickers with a new friend: Rilakkuma dressed up as a dragon for Chinese New Year celebrations. She wishes you all a happy and prosperous New Year! The egg custard tart recipe below uses a pâte sucrée style crust to house a rich, just barely custard. A couple of tips: use deeper tart tins, preferably with sides at least an inch high, so you can get the proper thickness of custard – a shallow tart won’t have the right ratio of crust to custard. Baking the custard is a bit like doing crème brûlée: it need to be just set but not liquid, so it barely yields to the bite. Watch the tarts carefully in the last few minutes of baking! And yes, these tarts are best consumed fresh! Combine butter and powdered sugar in a food processor and process until well combined. Add in egg and vanilla extract and process to combine. Add in flour and salt and process just until incorporated. Scrape out dough onto a piece of plastic wrap, flatten out into a rectangle, wrap and refrigerate for about an hour until firm. Preheat oven to 375 degrees F. Place six 4” tart tins on a baking sheet. Roll out dough to 1/16” inch. Cut circles and carefully fit into tart tins, pressing into bottom and sides. The dough should reach up at least 1” on the side. Refrigerate tart tins for about 10 minutes. Bake for 15 minutes until crusts are dry and just turning golden on the bottom. Remove from oven and let cool while you are making the filling. Combine sugar and water in a small saucepan. Bring to boil over high heat on stove. Remove and let cool to room temperature. Preheat oven to 400 degrees F. Whisk eggs and custard powder together in a medium bowl. Add in evaporated milk and whisk to combine. Add in sugar syrup and vanilla extract and whisk to combine. Strain mixture into a measuring cup to get rid of any lumps and foam on top. Fill tart crusts about 80% full. Bake for about 10 minutes in the oven. Turn heat down to 375 degrees F. Bake for 5 minute increments, checking to see if filling has set. It should take about 10 minutes more. If the filling starts to bubble, crack the oven door open a couple inches to let the filling deflate. If the crusts are browning too much, you may need to put some foil over the crusts to protect them. The top of the filling should look mostly set. The center may still look slightly jiggly. If a toothpick inserted into the center will stand up, it is done. Avoid overcooking the custard - if it looks completely set and firm, it’s overcooked. Remove from oven and let cool a couple minutes before unmolding and serving. They are best fresh! Kat, belated thanks for the holiday card and Happy New Year to you as well! Happy new year!! All the food look amazing!! Snickers is ADORABLE!! What kind of a dog is he?? Thanks Belinda! She’s a cockapoo and we think she’s pretty cute ourselves! All this food looks so tasty!! I love egg custard tarts! I used to eat them all the time or at least whenever we’d have them from the Chinese bakery. 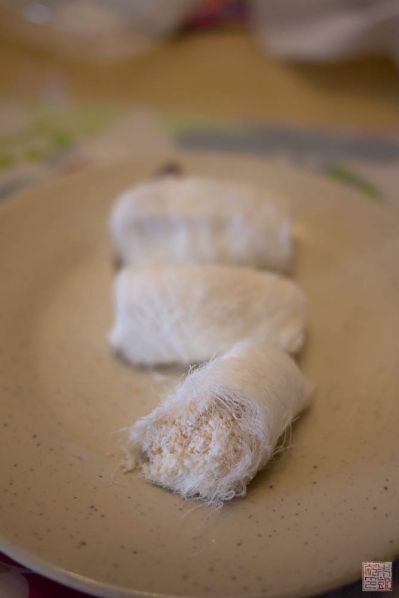 I’m really intrigued by the dragon’s beard candy now, I’d never heard of it before until reading your post. Gung Hei Fat Choy! Yummy custard tarts! My daughter-in-law is Chinese from Taiwan and lives in Atlanta. I’m way too far away from here (in Australia) but I would love to make these for her one day. 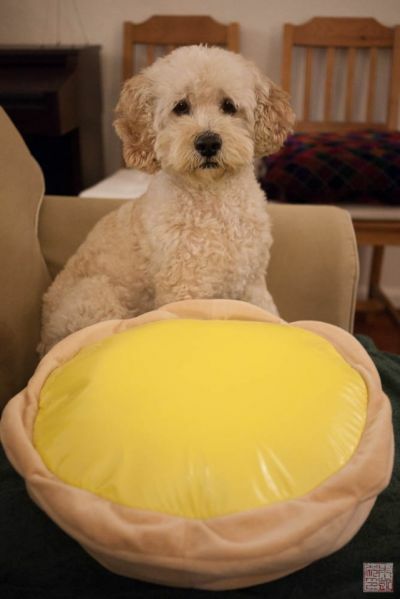 Shoot, I want a giant egg custard tart pillow for myself! Anita — Happy New Year! I love this post, because just like you, I’m Chinese (from Penang, Malaysia) but live in Sweden where all the delicious treats aren’t within reach. My mom is actually making some egg tarts right now, and they’re one of my favorites! Every time we go back to Malaysia, I always try egg tarts from different bakeries. My family is always on a food quest, it seems. Again, Happy New Year! Thanks for the tip! I’ll have to go check it out! Happy New Year, Anita! Year of the Water Dragon! Wishing you health, wealth, and love! 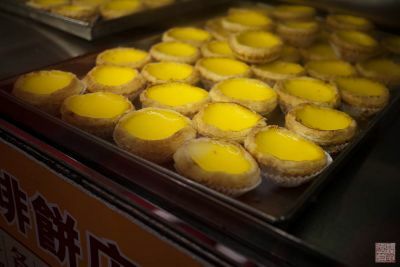 Egg custard tarts, by far my favorite when it comes to walking through China Town in London…although, a year back, I was quite taken with a heart-shaped mango custard that was floating on a bath of salty-ish milk! kung hei fat choi anita! your tarts look so yummy! It is so nice to see photos of food from Hong Kong. It actually makes me miss home a lot. Sift is my favorite bakery too! Have you tried their Signature Chocolate Cake? That one is my favorite and it is so tasty. This year was the first time I saw the dragon whiskers candy in Honolulu. It was during the Chinese New Year festivities, and if I hadn’t been so full from jin doi I would’ve tried some. Next time for sure!